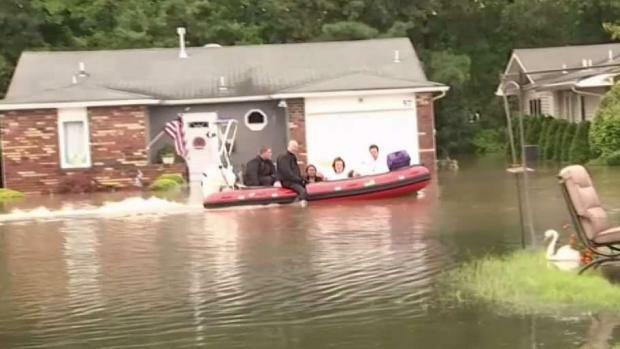 Nearly 100 people and pets had to be rescued from flooded homes in one New Jersey community as relentless storms with raging winds and rapid, torrential rainfall tore through the region Monday morning, threatening millions with flash floods -- and Storm Team 4 warns the risk is far from over. 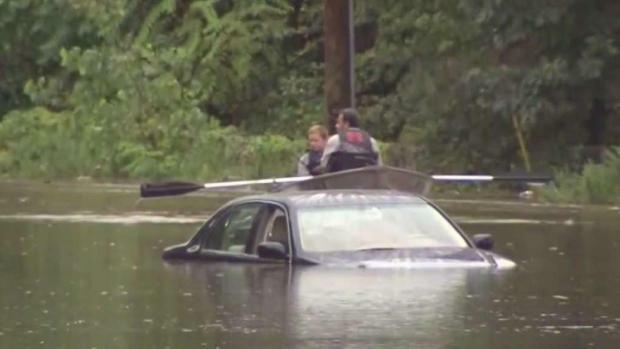 Authorities said about 70 homes flooded in Brick, where flash floods submerged vehicles and row boats were brought in to help save stranded drivers before noon. Parts of Ocean County, where a flash flood warning was issued, saw 2 inches of rain in 50 minutes at one point -- and Storm Team 4 says some spots could see up to 5 inches of rain before the wet weather moves out late Monday. One of those rescued, Renate Kupatt, said she lost everything in her home: "My couch was floating, my mattress was floating." 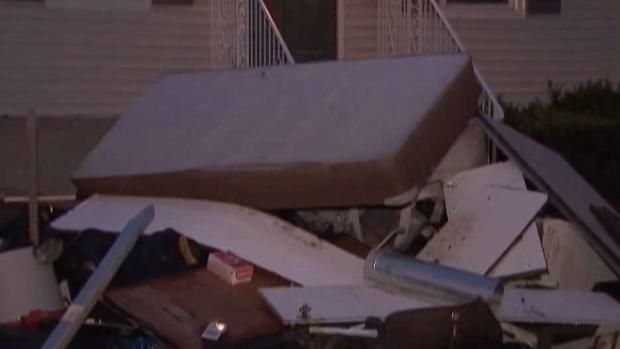 Over in Little Falls, New Jersey, officials said 190 homes were damaged and 32 are uninhabitable. 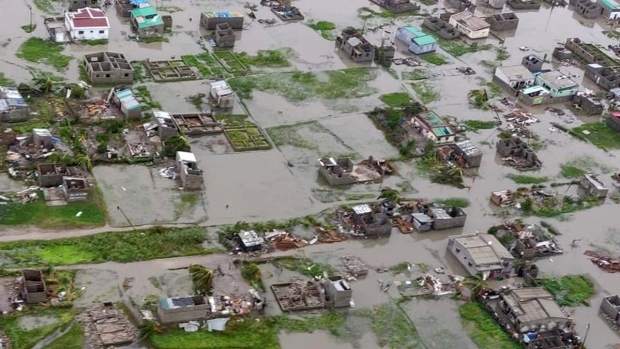 Forty-five people had to be rescued, and there were 21 fire calls; the scenes of devastation prompted a visit from Gov. Phil Murphy, who declared a state of emergency for the township. Officials say cars from a nearby dealership floated during flooding over the weekend, blocking water from the overflowing Peckman River and sending it into an area where flooding wasn't supposed to happen. Now that the water has receded, homeowners without flood insurance on Jackson and surrounding streets are at a loss as to what to do. Murphy has promised to "look at every available option." Damage and discarded furniture line the street in Little Falls, New Jersey, after relentless storms batter the tri-state. Checkey Beckford reports. 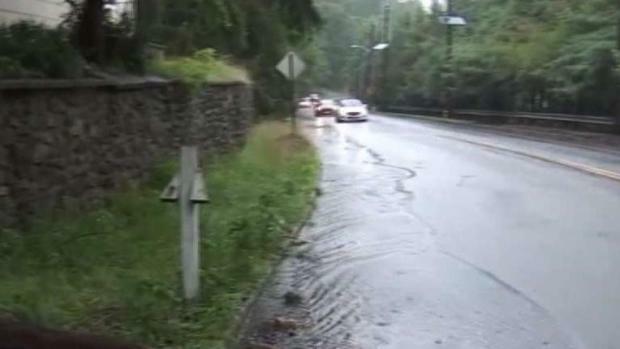 Flood warnings remain in effect for New Jersey's Essex, Passaic and Morris counties. The five boroughs are under a flash flood watch, along with much of New Jersey, until midnight. Local states of emergencies are in effect for some New Jersey communities, including Brick and Howell. Watch StormTracker 4 live as wild weather hits, and check the latest severe weather alerts for your neighborhood here. Hundreds of local flights have been canceled or delayed, so check with your carrier before heading out. The continued threat for unsettled weather follows a weekend that saw some parts of the tri-state area get nearly 2 inches of rain while others didn't see a drop. On Saturday, heavy rain and flooding forced Penn Station to close its Seventh Avenue entrance, according to New Jersey Transit. Get real-time commute updates from all your key sources here as the storms hit. Wale Aliyu is in Howell Township where many people are struggling to clean up and dry out after extreme flooding in New Jersey. A day later, JFK Airport set a daily record for rainfall with 1.84 inches, but LaGuardia Airport, Newark and Central Park saw zero inches of rain. Islip on Long Island saw just under three-quarters of an inch. The weather is expected to stay humid, sticky and damp through Tuesday as highs move back into the high 80s, Storm Team 4 says. It won't be as widespread or severe as on Monday, but any heavy downpours are capable of producing additional flash flooding, Storm Team 4 says. One New Jersey town is working to wring out from a weekend of storms while battling more rainfall. Checkey Beckford reports. High pressure builds back in from the southwest by mid-week, Storm Team 4 says, paving the way for warmer, brighter and drier conditions on Thursday and Friday.